Assessing the potential contribution of carbon capture and storage (CCS) to limiting climate change must take into account the huge physical scale of the materials being captured and transported. In my previous post I looked at the slow growth of carbon capture and storage (CCS) and carbon capture and use (CCU). In this post I look at the scale of CO2 that needs to be captured to make a material difference to the climate, and some of the implications of this. As reference points, the chart below shows annual production of major commodities. The mass of fossil fuels produced and consumed each year is huge – about 12 billion tonnes every year, over one and a half tonnes for each person in the world. That is much more than other major commodities. Wheat is less than a billion tonnes per annum, the iron ore for the world’s iron and steel industry is a little over two billion tonnes, and cement is something over four billion tonnes. However the CO2 produced from energy and industry (so excluding land use), is much greater still – about 36 billion tonnes. The vast majority of this comes ultimately from the world’s fossil fuels. Very simply, the mass of the fossil fuels is mainly carbon, and burning this carbon adds two atoms of oxygen to each atom of carbon, more than tripling the mass, hence the scale of the mass of CO2 produced relative to fossil fuels. Even capturing and transporting around a third of current emissions would involve dealing with masses as large as the current fossil fuel system, which has required, cumulatively, tens of trillions of dollars of investment over many decades. Many low carbon technologies have faced similar challenge of scale. For example, it has taken decades to get wind power to the scale where it is making a material difference to emissions. The problem gets even worse for any process of CO2 capture from the air that involves use of a solid to bind the CO2. This is because binding CO2 as a solid inevitably involves adding mass. For example, if theCO2 were eventually to end up as limestone (CaCO3) the limestone would have more than double the mass of the captured carbon dioxide. This is especially important for some of the proposals for removing carbon dioxide from the atmosphere by direct air capture into solid form. To make any worthwhile reduction in atmospheric concentration hundreds of billions of tonnes of solid material will be eventually be generated. For this reason it is often considered that air capture is best located the source of the scrubbing mineral and where it can be easily disposed of, but the masses involved are nevertheless huge and handling remains a huge problem. The challenges raised by the mass of CO2 produced by energy use extends to the development of more localised technologies. Suppose, for example a new technology were invented for carbon capture, capable of cheaply absorbing and binding in solid form CO2 produced by a standard domestic heating boiler. A typical UK household burns about 16,500 kWh of gas per annum[ii], which generates about 3.3 tonnes of CO2. Any attempt to capture this would produce many tonnes of material a year to be disposed of. This compares with current total waste per household at present of around 1 tonne per household. Alternatively, if household CO2 capture were based around solvents to regenerated while the CO2 is piped away, this would require huge amounts of new pipeline infrastructure. This is unlikely to be practical. Instead any CCS is likely to be deployed centrally, for example as part of low carbon hydrogen production, with the hydrogen burnt to produce heat, or for production of low carbon electricity. The vast scale of CO2 emissions has several implications. First, it will usually be much better to avoid creating the CO2 in the first place than to try to deal with it as a waste problem. The waste problem is already too big to handle, so adding more in the hope of being able to deal with it is not likely to be the best option. Second, any system that does make a material contribution to reducing climate change will take vast investment and many years to build – which is a good reason for starting now. Third, making CCS and CCU more economically viable would help, and this is one of many reasons that higher carbon prices are desirable. There are however two important caveats to this. One is that land use does have an important contribution to make. The scale of release of CO2 from land use and, correspondingly, the potential benefits from reducing deforestation and improving management of biological sinks are large. However, as I’ve previously noted, there are limits on the availability of biofuels. The other caveat is that all contributions to reducing emissions are welcome, and there may be cases, especially in industry, where there are few if any alternatives to capture. Reducing emissions will require a very large range of technologies to be deployed. Nothing I’ve said in this post should be taken as a reason for not proceeding with CCS or CCU. As I noted in my previous post CCS continues to look necessary in a range of applications. And building an industry at the scale required will take decades, and there is an urgent need for progress. It is imperative to recognise just how large the physical scale of the challenge is, even relative to other economic activities such as iron and steel production often (rightly) thought to be very large scale. [i] Based on data in the BP statistical review of world energy, UN Food and Agriculture organisation, EDGAR database, USGS, http://www.worldcement.com. 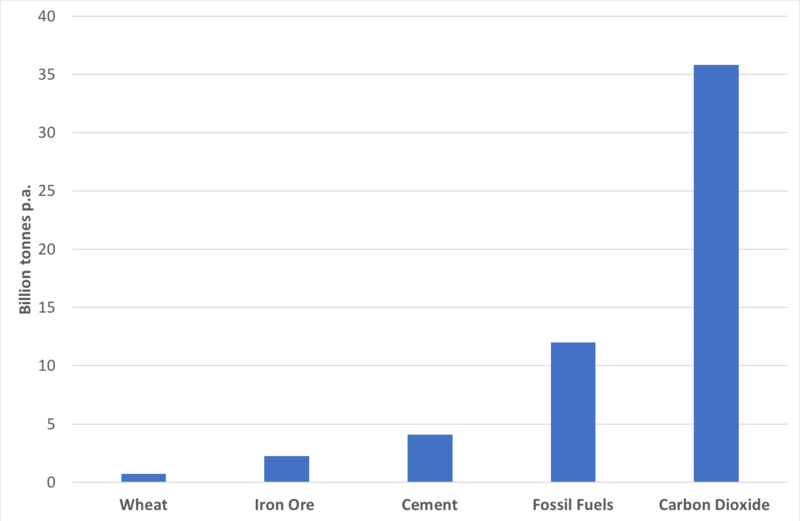 The ratio of fuels to carbon dioxide is not exactly the same as the ratio of the masses of carbon to CO2, which is 3.7, because of the other components in fossil fuels. The CO2 total includes emissions from industrial processes in addition to combustion. However many non-combustion emissions, such as the use of carbon in anodes from aluminium smelting, and (depending on your definition of combustion) the use of coke in blast furnaces also use fossil fuels as their source of carbon. This entry was posted in Climate change policy on 21/05/2018 by adamwhitmore.